As expected, Shaji Pappan and his boys received a thunderous welcome on-screen. They are back, one of the most awaited group of imbeciles! 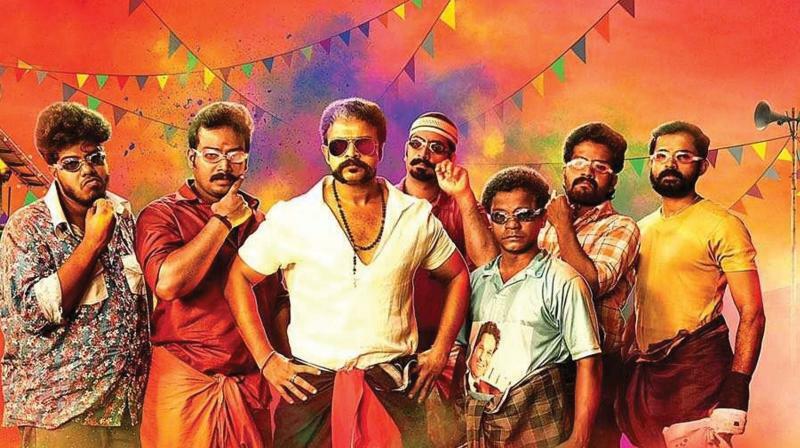 As expected, Shaji Pappan and his boys received a thunderous welcome on-screen, thanks to the cult status Aadu Oru Bheekara Jeeviyanu enjoyed much after it’s release. It is pretty much the same thing, this movie too is made up of a series of unfortunate and unexpected perils that Shaji Pappan and his gang is forced to face. The difference, however is that, this time they have new troubles. It obviously would not have made any sense if they were still stuck onto Neela Koduvely (The thing that started it all). That episode of Pappans life is over, a glimmer of hope in the name of Pinki and Neela Koduvely ended with the first part of Aadu. Jayasurya’s Pappan and the boys have been leading the same old life with an occasional tug-of-war competition to brighten their spirits. Yet again things start taking a different turn once they decide to take part in yet another tug-of-war competition. This time Midhun Manuel Thomas knew exactly what he was doing. He now knew the pulse of his audience. He probably also learnt that people have warmed upto the idea of this format of comedy. What was an additional boon for Aadu 2 is the current change of political atmosphere, that Midhun has very tactfully presented. Midhun toys with the audience’s brains by adding a dash of sarcasm to showcase present day socio-political scenario. One might have to think for a second before deciding whether to get offended or not and before the decision is made, the person would probably be falling off their seats laughing. This movie is a laugh riot through and through. But the movie is not without flaws. There are too many sub-plots. Yes, all of them would ultimately culminate at one point. But the director spends a little extra time here and there, trying to give enough screen time for everyone,especially the other prominent characters from Aadu 1. This made the first half stretchy. Interesting but short lived new characters are introduced. Enough justification is given for the presence of each of these characters. It also felt that some of the characters from the previous part was brought in just to satiate the fans, no one would have questioned even if they were not a part of this one. The comical fight scenes too dampened things a bit. That aside the movie is an entertainer. While Shaji Pappan’s costume has already caught up with the masses, keep an eye out for Abu’s eye popping style too. Coming to Shaji Pappan,Jayasurya is in full form, delivering a brilliant performance. The rest of the boys have done a great job. Vinayakan as ‘The Dude’ gives a winning performance with his spot on comic timing. Shaan Rahman has added more zing to the movie with his upbeat music yet again. Yes, they have retained some of the favourite tunes too. It must be warned though, that those looking for an intellectual high needs to stay away from this one. Walk into Aadu 2 as if you are sitting to watch a long Looney Toons or Tom and Jerry and get ready to indulge in endless rounds of belly aching laughter.